Due to some excessive radiation exposure by the toxic waste landfill created by a local mad scientist during a recent experiment, you have a bloody exposed mutilated decomposed chest! Or perhaps other zombies have started to snack on your undead corpse. 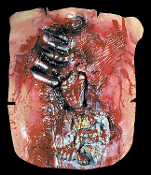 Gory chest is exposed to see all the inner organs. Very bloody. High quality latex construction allows this mad doctor victim apocalypse costume prosthetic prop accessory to have amazing detail. A gross and horrendously graphic creep-show style walking dead inspired prop with great detail, will definitely get you noticed. Perfect for any party, costume or otherwise. All latex bloody mutilated chest piece, attaches with velcro at waist and neck. One size fits most adults. Awesome realistic looking special effects! This Costume is Extreme, easy and comfortable. Serious attention to disturbing detail in this awesome cosplay horror costume accessory.